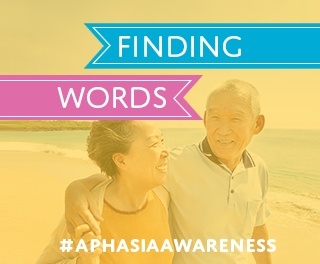 In this post, learn how to join our Finding Words campaign and submit your answer for our Aphasia Awareness Month campaign. The Finding Words campaign is open to all individuals touched by aphasia including caregivers, clinicians, medical professionals, support groups, aphasia centers and more. Follow the directions below to submit your story. Visit the homepage of the campaign and review all of the story submissions. You'll find inspiration from many different faces! Step 2: Click "Submit Your Story"
Click the top blue, "Submit Your Story" button. You'll be directed to a form where you can submit your answer to, what one word would you use to describe aphasia and why? You can also click the button below to be re-directed to the site and submit a story. In addition to the answer to your question, don't forget to include your photo and an email address. We will email participants aphasia-related news throughout the month of June. Plus, when you submit a story you have a chance to appear in the "Finding Words" E-book to be released at the end of the month. Once your story is approved (this process usually takes 24 hours) share it on your Facebook, Twitter, Pinterest or Instagram account using the hashtag #AphasiaAwareness. Please note, Lingraphica and its partners may share your story on their own social media pages. At the end of the month we will release an eBook featuring a collection of stories, quotes, and post about aphasia. The eBook is free to download and will be made available to all Finding Words participants.